The number of internet shutdowns is dramatically increasing around the world, according to our new Shutdown Tracker Optimization Project (STOP). Launched as part of the #KeepItOn campaign, our project aims to develop a list of internet shutdowns, and provide information on the scope, magnitude, and context of these events. 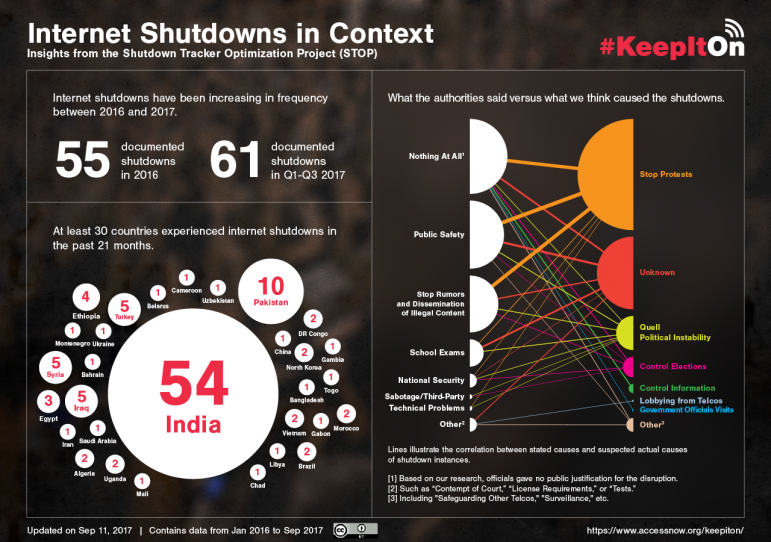 We’ve found through our research that disruptions happen in nearly every region, occurring most often in India, and that governments overwhelmingly use shutdowns to silence political opposition from their citizens. It’s only September, but 2017 has already surpassed the number of shutdowns recorded in 2016. We already know that internet shutdowns violate human rights and drain economies, but STOP has confirmed our worst suspicions that internet shutdowns represent an increasingly popular tool of repression. An intentional disruption of internet or electronic communications rendering them inaccessible or effectively unusable, for a specific population or within a location, often to exert control over the flow of information. This definition includes full network shutdowns, bandwidth throttling, and service-based blocking of two-way communication platforms, such as social media (for example, Twitter, WhatsApp, and Viber) or email. Our data are not limited to shutdowns involving governments. For example, the tracker includes an instance in 2016 when the Islamic State of Iraq and the Levant (ISIL) banned private internet access in Raqqa. The STOP differs from some existing trackers in the way it defines what we call a shutdown “instance.” A single instance is a disruption event lasting longer than one hour, or a series of disruptions attributable to the same or similar circumstance, justification, method, and perpetrator. For example, a “digital curfew” under which the internet is shut down during the same hours every night for several days in a row would be considered a single instance. The current tracker includes data from 2016 and 2017 and compiles information acquired from various sources: news articles, which are included in the document; local actors, through Access Now’s Digital Security Helpline or the #KeepItOn Coalition email list; or directly from telecommunication and internet companies. Instances that have not been corroborated, or for which it is unclear whether the disruption was intentional, may be included in the tracker in a separate category until they can be confirmed. For example, many websites are down in Venezuela; however it is unclear whether this is due to infrastructure collapse or intentional blocking. Importantly, the STOP demonstrates how vital it is to understand the context surrounding each disruption. Improvements in technical measuring tools are crucially important, but to fully understand — and end — shutdowns, we need the rich local information that civil society actors and journalists can provide. The most concerning finding is that the number of shutdowns is dramatically increasing. There were 55 shutdown instances recorded in 2016, and, with three months left in the year, there are already 62 instances recorded in 2017. Most of these take place in Asia, which had 53 recorded instances, primarily because of the shockingly high number of shutdowns in India and Pakistan, and Africa which had seven. This count reflects the number of new shutdown instances that began that year, as the STOP does not double-count instances that span multiple years. In 2017, the most common official justifications for internet shutdowns were “Public Safety” and “Stopping Rumors and Dissemination of Illegal Content” which were used 21 and 18 times respectively. These justifications are often code-words for political events such as public protests, which were involved in 31 instances this year. Elections continue to trigger internet shutdowns in alarming numbers. Although in 2017 we’ve seen only three shutdowns related to elections, compared to the total of eight in 2016, many elections have yet to occur that we will monitor. For both 2016 and 2017, India has had the highest number of internet shutdowns, with 14 instances in 2016 and 40 in 2017. Unlike most other countries, shutdowns in India have also overwhelmingly been ordered by local governments, including police, instead of by national authorities. On August 7, 2017, the Ministry of Communications in India issued rules for shutting telecom services – and by extension, the shutdown of internet services across India. These regulations were quietly developed without civil society participation, or even notice, despite active advocacy on the issue from key stakeholders. Although these new regulations may limit who can order shutdowns, they bypass a more fundamental question: do shutdowns have any place in a democratic society? Regulators should not that assume the Indian Constitution or telecom laws allow shutdowns, but rather invite public comment and expert hearings on that question, before passing regulations legitimizing the practice. Further, the regulations continue to allow shutdowns to occur without interrogating the justifications or establishing a high bar for when they can be enacted. Why create and share it? The STOP contains information about internet shutdowns that, although often publicly available, is hosted in disparate locations. Our hope is that aggregating these data will make it easier for advocacy groups and researchers not only to find information about particular shutdown events, but also analyze local, national, and global trends in shutdowns. We felt an urgent need to publish our data given the growing scope and severity of shutdowns globally. However, we recognize that this database is limited, especially in terms of its technical categorizations, and we are actively seeking feedback on the clarity and accuracy of these indicators, as well as any other information on the documented shutdowns. We also have a richer data schema that is not ready to publish, but which we hope to integrate with the current tracker and incorporate with community feedback. The next iteration of this tracker will consolidate indicators in order to most effectively reach our goal of informing target audiences of the existence and context around internet shutdowns, globally. Download the Shutdown Tracker Optimization Project here (Xcel format) and a readme file explaining our detailed methodology here (PDF). For inquiries and comments, contact Peter Micek, General Counsel, at peter@accessnow.org. The #KeepitOn campaign, convened by Access Now, consists of 141 organizations from 59 countries that are devoted to fighting internet shutdowns. Since the campaign launched at RightsCon Silicon Valley in 2016, we’ve seen major victories: the UN Human Rights Council condemned internet shutdowns; 30 governments of the Freedom Online Coalition spoke out against shutdowns, as well as the GSMA, the Global Network Initiative, and the African Commission on Human and Peoples’ Rights. And, together with local activists, we helped end major internet shutdowns in Cameroon and Gambia.